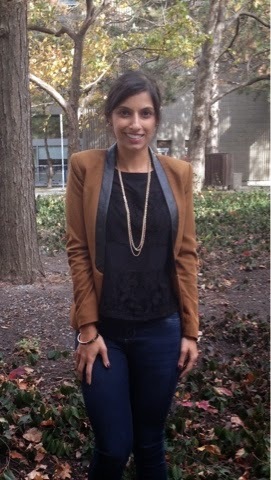 love the leather lapel on your blazer so chic! xO! Welcome back to blogging! I've missed you. I'm so glad you enjoyed your travels and I look forward to hearing all about them. I love that blazer! The colour is so rich and the contrasting lapels add so much to the look. Did you know that I've started a weekly fashion feature on my blog? Stop by on a Friday to see what I've written. After all, you are one of my inspirations! Absolutely lovely outfit :-) Glad you're blogging again, can't wait to read the travel series!